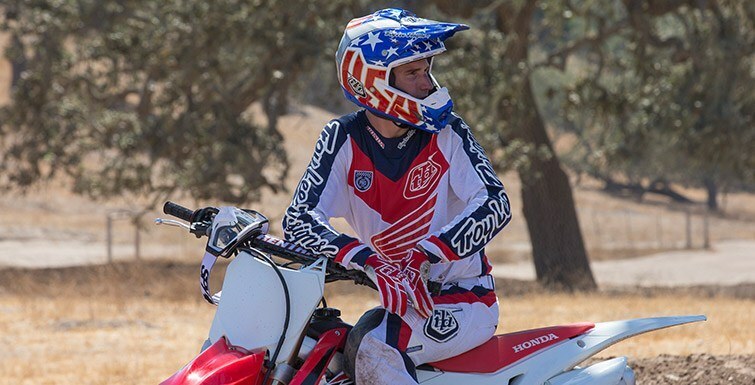 Honda’s CFR450R is the nuclear option in the motocross wars. Light, powerful, nimble, responsive, it offers the most performance and refinement of any bike in its class. For 2016, we’ve made some fine-tuning changes that make it a little better, but the big features that separate it from the pack remain. 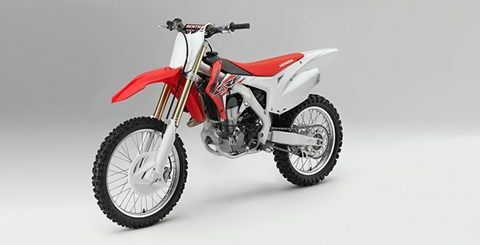 For example, there’s the CRF450R’s Engine Mode Select button that lets you choose between three settings (Standard, Smooth and Aggressive), just by pushing a handlebar-mounted button. Use that in conjunction with our available HRC Fuel Injection Setting Tool, and it’s easier than ever to adjust your engine’s output for specific track conditions. 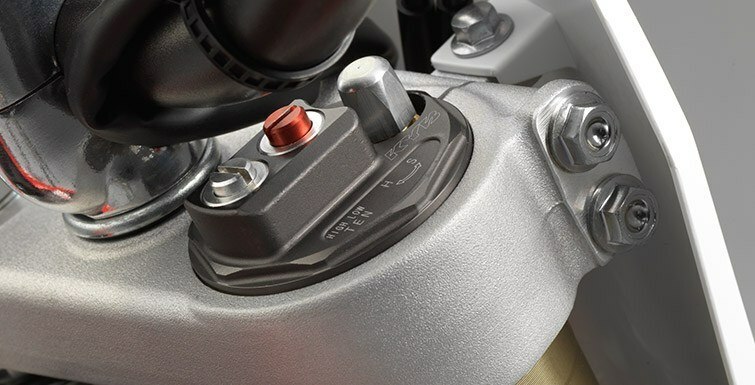 Next, the CRF450R's revolutionary KYB Air Fork features both high- and low-speed compression and rebound damping, letting you dial in the CRF450R's suspension in much quicker. Details like a fork that’s five millimeters longer this year and a new shock link help make the CRF450R even more stable. There’s even a new chain roller to help. All in all, you have everything you need to put you up front, from the second the start gate drops to when the checkered flag falls. 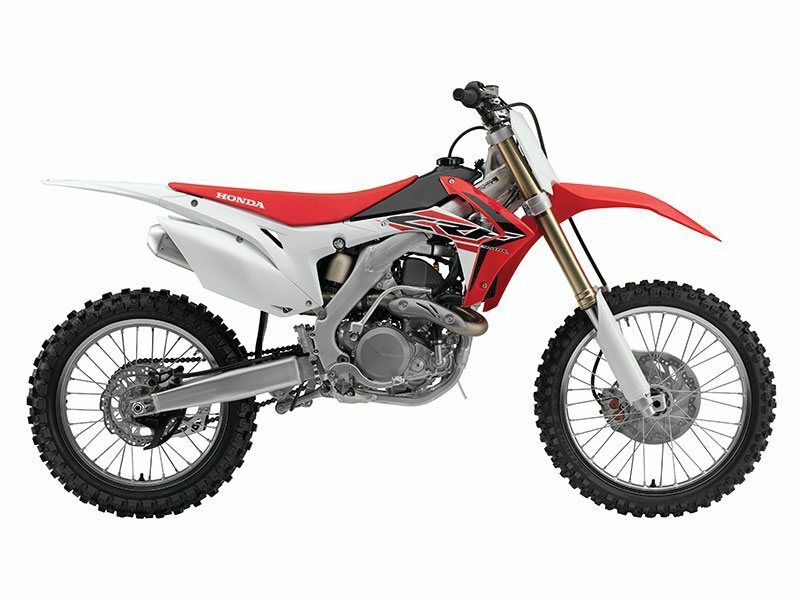 AIR-FORK FRONT SUSPENSION: The CRF450R's revolutionary air fork is a 48mm inverted KYB PSF (Pneumatic Spring Fork), easily adjustable with a simple air pump. This year it’s five millimeters longer to enhance the bike’s stability. 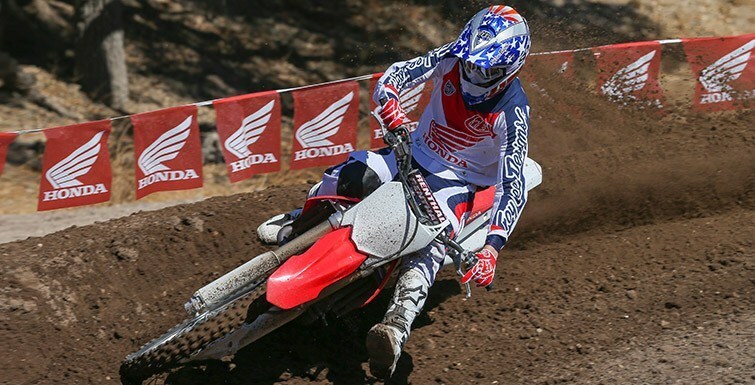 Its high/low-speed compression and rebound-damping adjustments let you can dial it in to help keep your front tire planted for better tracking through turns and across whoops. HONDA PROGRESSIVE STEERING DAMPER (HPSD): The HPSD is designed to work in conjunction with the front and rear suspension to give you unmatched steering precision under braking, acceleration, and in the whoops, ruts, and hardpack. There's nothing like it! 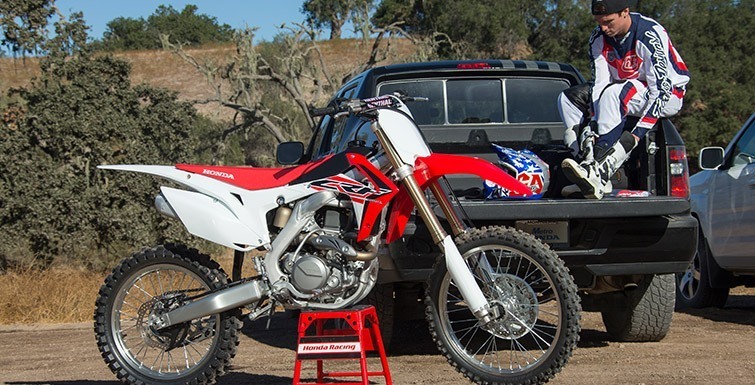 BLACKED-OUT ACCENTS: Blackened radiator fin guards, rear disk guard and brake line guides look sharp and help the CRF450R stand out from the competition. 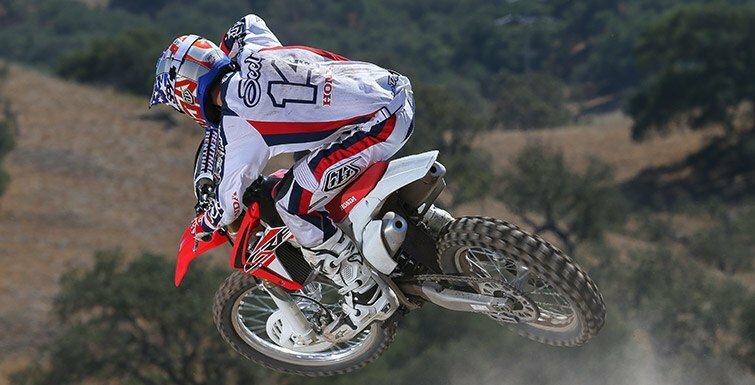 260 MM FRONT BRAKE: The CRF450R’s large front-brake disc measures a whopping 260mm. You get great brake feel and a wave pattern that cuts down on weight. Front and rear black brake guards are part of the package too. CYLINDER HEAD LAYOUT: The CRF450R’s exhaust header exits the head from the right side, which lets us shorten the header by 320mm. The design delivers more top-end power and over-rev, plus better low-end torque feel. 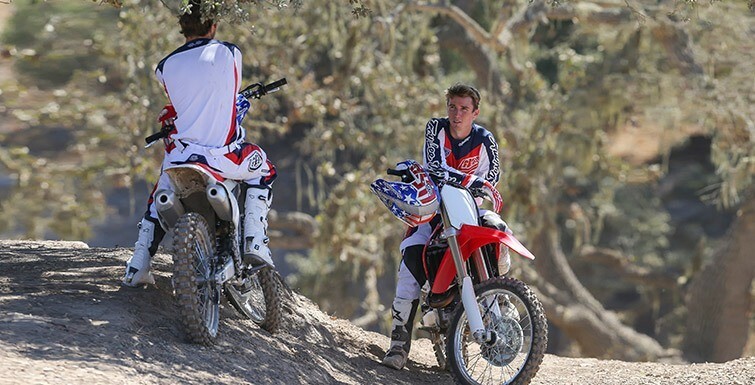 REVISED PGM-FI: The settings on the CRF450R's Programmed Fuel Injection emphasize low- and mid-range power, and help deliver smooth, predictable engine performance. 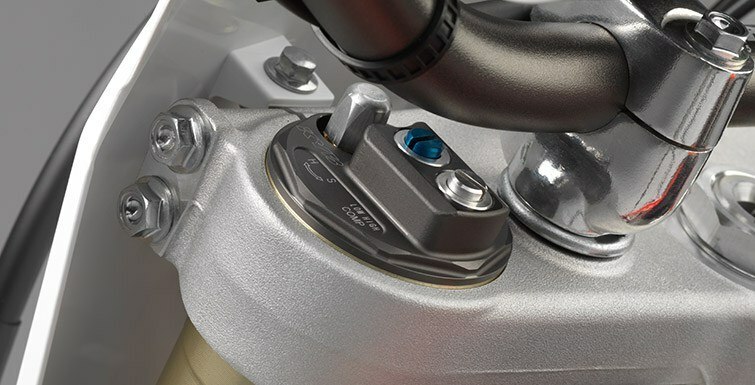 With our available HRC Fuel Injection Setting Tool, it’s easily adjustable to specific track conditions and refines your settings in place of the smooth and aggressive settings on the engine mode selector. NEXT-GENERATION ALUMINUM FRAME: Our Next-Gen twin spar aluminum frame is designed to work with the KYB air fork, suspension components and subframe to improve mass steering feedback, suspension action, chassis stiffness and compliance. REAR SHOCK LINK: A new shock link, working in conjunction with the new, longer fork, helps improve the CRF450R’s chassis stability. 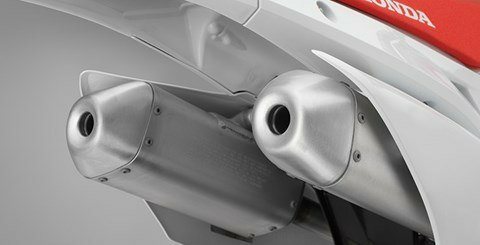 SHORT TWIN-MUFFLER EXHAUST SYSTEM: The CRF450R’s dual exhaust system is compact and positioned close and low in the frame’s center to take weight off the rear end and bring more mass to the bike’s center for improved handling. 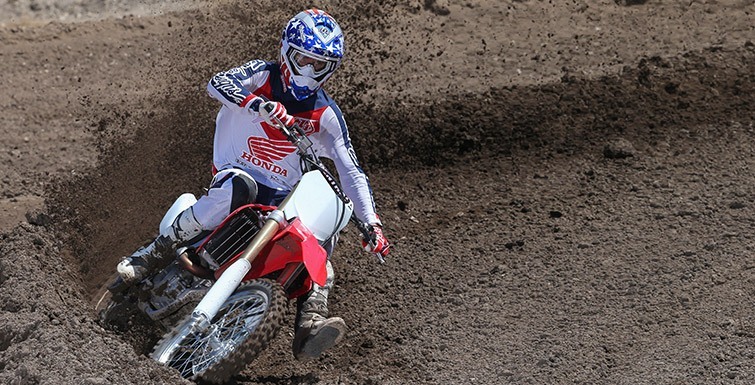 DUNLOP MX52 TIRES: Developed using Dunlop’s “block-on-block” technology, the unidirectional MX52FA front tire and MX52 rear tire give excellent feedback and traction, and are a perfect complement for the CRF450R’s revised suspension. 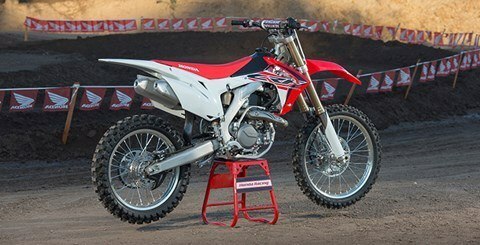 CHAIN ROLLER: We changed the chain roller size this year from 38mm to 34mm to fine-tune the CRF450R’s handling. 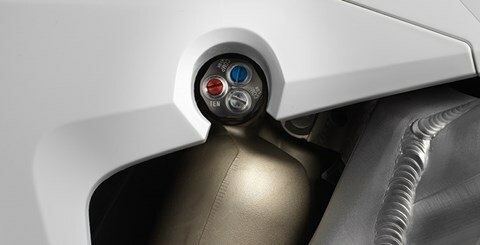 ENGINE MODE SELECT BUTTON: This simple handlebar-mounted button lets you dial in engine power delivery character with a push of your thumb. Choose between Standard, Smooth and Aggressive, depending on track conditions. If you want to change up the settings, you can reprogram the Smooth and Aggressive modes with our optional HRC Tuning Tool for a custom-tailored power delivery. NEW SUSPENSION SETTINGS: The small refinements in fork length and the new shock link mean we also tweaked the CRF450R’s suspension settings to keep things balanced.